Shake Shack? More like rain shack. On a rainy Friday morning, I arrived in New York City for the first time as a meat blogger with one goal: to eat. Most importantly, I had to eat at the Shake Shack. I had heard much about the Shake Shack from the New York-centric food blog known as Serious Eats, yet there are plenty of good burgers in LA, so I never felt an overriding desire to get a burger at Shake Shack. 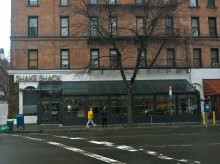 Then I heard that Shake Shack was run by none other than Danny Meyer, the famous New York restaurateur. More importantly, though, is that Meyer is a fellow alum of Camp Nebagamon, the greatest place in the world (if you don’t believe me, read this). No doubt, his restaurant skills draw upon his experience at Nebagamon and I made sure to get to Shake Shack as early as possible to see what those skills had created. Due to the inclement weather, we headed to the Shake Shack on the Upper West Side, since the original at Madison Square Park only offered outdoor seating. Even though it was Friday, there was already a short line of school children waiting outside for the place to open at 10:45. This was a good sign that Shake Shack was at least better than school cafeteria food. As soon as the doors opened, we headed in and checked out the menu. I chose the double ShackBurger, cheese fries and a peanut butter shake. The only way to pack more cow products into that meal would have had required veal (which I chose to hold off on until the next meal). The ShackBurger came with lettuce, tomatoes, cheese and the special Shack sauce. I ordered without those pesky tomatoes and lettuce and then found a seat to wait for my meaty feast. As soon as our buzzer went off, I sprinted to the counter in excitement. Before I ate, I took a minute to revel in the beauty of what lay before me. Then I dug in. The burger was different from the usual fast food burger, but certainly not gourmet. It overflowed with cheese and sauce, but was held somewhat intact with a wax paper wrap. Grease, also known as flavor juice, turned the paper clear and was a sure sign of greatness. It was juicy, cheesy and just as good as I had hoped. 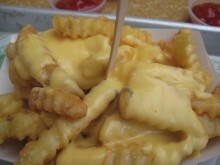 The fries were also great and were a definite cut above usual fast food fries. Per my order, they were covered in a creamy cheese sauce that avoided the usual plasticky texture while refusing to coagulate. Almost like being back in Duluth. 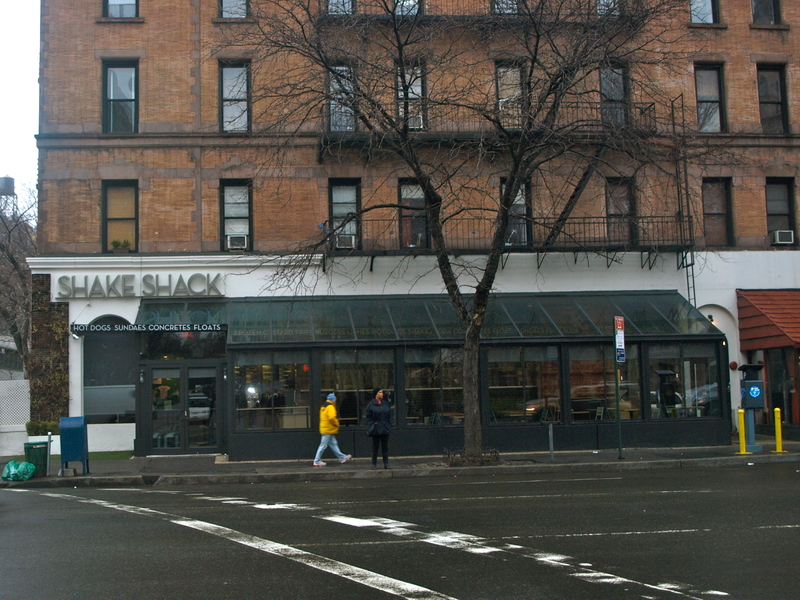 Finally, there was my shake, the namesake of the Shake Shack. 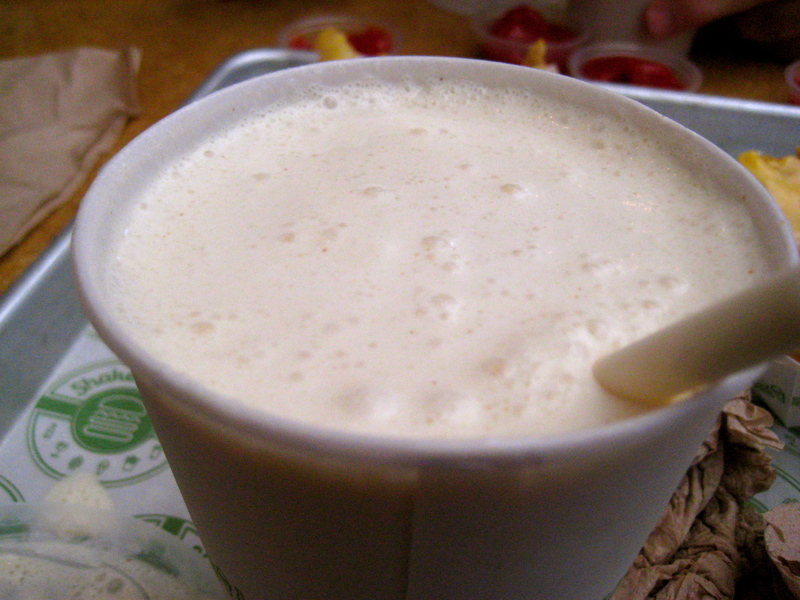 Undoubtedly, the shake drew inspiration from the Portland Malt Shoppe in Duluth, Minnesota, about 30 minutes from the village of Lake Nebagamon, Wisconsin. It didn’t have the usual thick texture you would expect from a peanut butter shake, but packed a solid peanut butter taste. In truth, I would have liked the shake to be a little thicker, but it wasn’t bad by any means. By the time I slurped up the last bit of shake, I was one stuffed and happy unvegan. Although I’m not lactose intolerant, I think my body reached its maximum daily lactose intake halfway through my meal. A double cheeseburger, cheese fries and a milkshake is far more dairy than man is meant to ingest and I paid the price a couple hours later. As painful as that stomach ache may have been, it is far easier to remember the great taste of that burger, which means I would undergo those stomach pains again in an instant to get my mouth around another ShackBurger. Next time, however, I might choose regular fries and a glass of water to ensure that my stomach makes it to my next meal in one piece. In the end, Shake Shack is definitely a must for any hungry meat eater in New York, whether they come from Los Angeles or the Yo Yo Islands. How does it compare to the burgers in Los Angeles? Good question. Considering I didn’t have to wait in line and the burger didn’t taste like it was loaded with sodium, it has a strong edge on In-N-Out. The fries were also far better than those soggy things In-N-Out serves. It has a slight edge on Five Guys, although loses points if you are looking for the variety of toppings that Five Guys offers. It’s tough to compare a burger like this to the likes of Umami and other gourmet burgers because they are entirely different breeds. However, it is nice to get a burger like this and order it your way without dealing with the pretentiousness of chefs who think replacing or removing an item from the burger will ruin it. I have had both so I would say I would have either Shake Shack or In-N-Out cheese-burger but DEF would only eat the Shake Shack fries again! why arent you getting your in & out fries well done? Its the ONLY way to eat them!!! I agree, but you shouldn’t have to order fries well-done to be edible and even when they are well-done, they are not as good as Shake Shack. Awesome review! 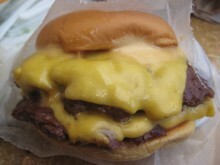 We just went to NYC too, and had to try Shake Shack based on WOM. Awesome, if you ever come out to LA, let me know, there are tons of great burgers out here.